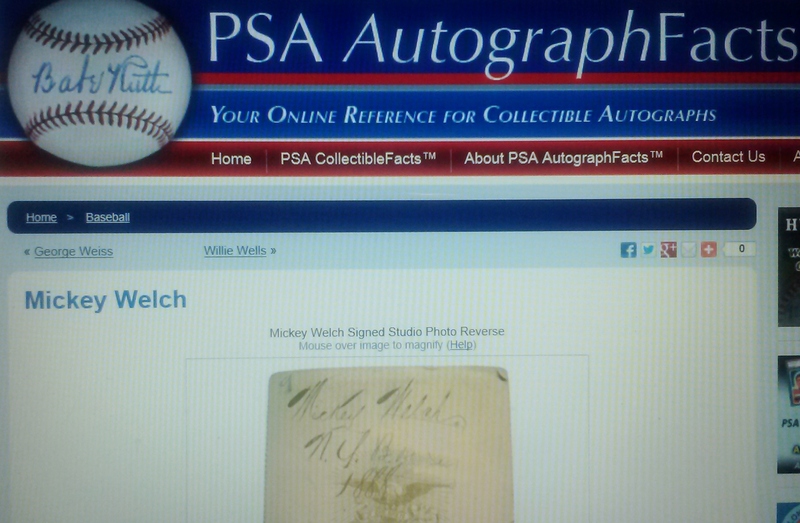 PSA uses a stolen cabinet photo NOT signed by Mickey Welch as an exemplar on its Autograph Facts page. PSA/DNA had quite a February starting with its authentications for Heritage Auctions of a forged $150,000 1927 Yankee ball and an alleged Lou Gehrig ball supposedly signed at a time when the “Iron Horse’s” hands were paralyzed by ALS. The Gehrig ball was pulled from Heritage’s Platinum Night Auction in New York City. The month continued with PSA founder David Hall appearing on an ESPN 30 for 30 short film saying, with a straight face, that he didn’t think the infamous T206 Gretzky-McNall Wagner card had been trimmed. This, despite the fact reports indicate ex-hobby king Bill Mastro will plead guilty to altering the Wagner card later this month. Now, via Tweets on Twitter, the controversy continues as PSA President, “Clueless Joe” Orlando, announces more flawed additions to PSA’s Autograph Facts page of autograph exemplars that the company advertises as a resource for collectors and utilizes in its lucrative authentication business. 1. 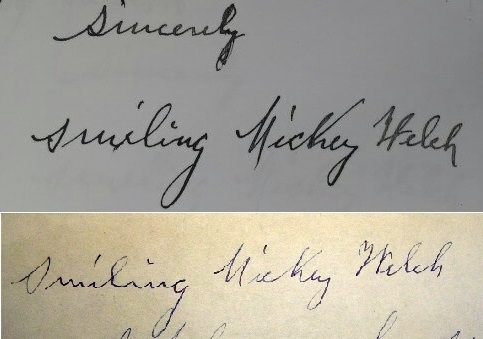 The alleged Welch signature is merely an identification and not an authentic autograph of “Smilin’ Mickey”. 2. The Stevens cabinet card of Welch, itself, is listed on the New York Public Library’s “Missing List” and was stolen from the library’s famous Spalding Collection in the 1970s. Several Stevens cabinets were stolen from the library, some of which have already been recovered, but the Welch, along with a Cap Anson cabinet, are still among the missing and the subject of an on-going FBI investigation into the NYPL thefts. PSA/DNA has hit most likely has written an LOA for the signature on the cabinet card, which was not signed by Welch, and also have knowledge of the whereabouts of the item for the Feds, who are already investigating the company in relation to the Mastro investigation and the grading and authentication of the “PSA-8″ Honus Wagner card. Here’s the damage from PSA: The authentication giant first displays an authentic exemplar of Welch’s signature that originates from a handwritten ledger of the New York Giant Baseball Club that was sold at Hunt Auctions as a consignment from Keefe descendants. However, they apparently can’t tell that the signature on the reverse of the cabinet card, which also appears as an exemplar, is not in the same hand or even close to the signature on the authentic ledger page. 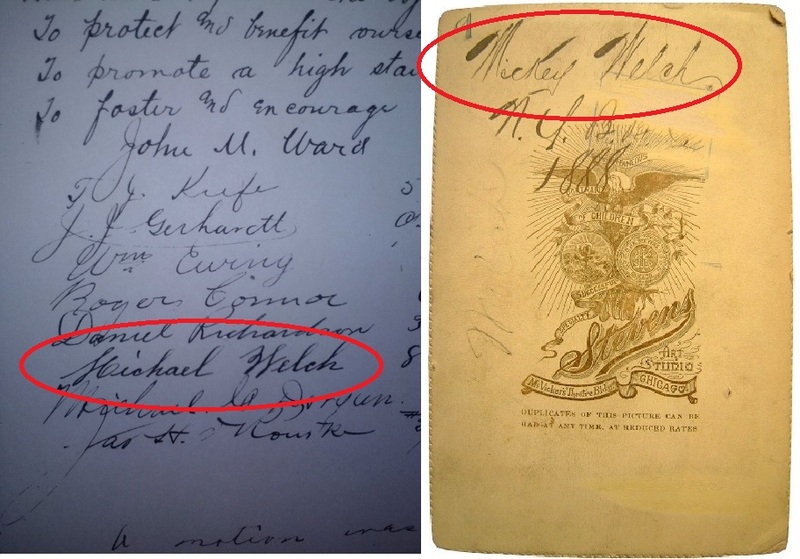 PSA uses an authentic Welch signature from Tim Keefe's ledger and also a non-genuine exemplar of Welch which is actually a period identification on a card stolen from the NYPL. The disparity between the authentic signature and the period identification on the cabinet card is striking and illustrates best the negligence and apparent consumer fraud that is a regular occurrence at PSA/DNA. No doubt some collector is sitting with the Welch cabinet card in his collection, totally confident that he owns an authentic signature of one of the toughest HOFer autographs known to exist. If authentic, a Welch signed cabinet card would command upwards of $50,000. However, this card is worthless to that collector as a plundered artifact that will end up being confiscated by the Feds. These three Stevens cabinets stolen and recovered by the NYPL show the same hand executing period identifications of Connor, Tiernan and Ewing. If you still actually believe that Welch’s genuine signature is on the card, just take a look at three of the companion Stevens cabinet photos from the New York Public Library’s Spalding Collection. 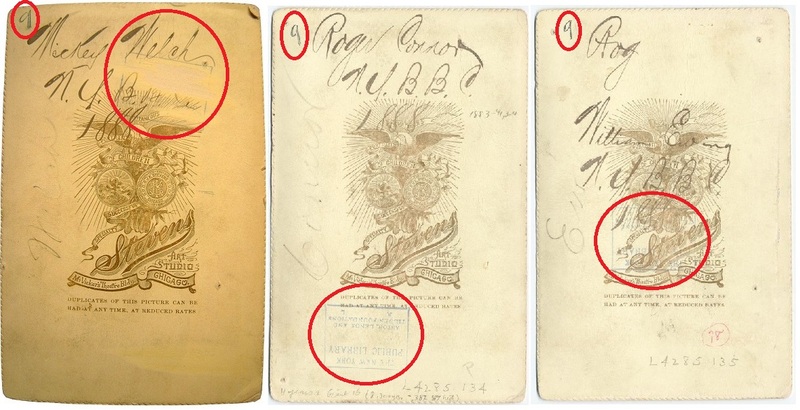 Here we see period identifications written in the same hand for Roger Connor, Mike Tiernan and Buck Ewing along with identical inscriptions of “NYBBC.” If you can’t tell these are all in the same hand, as PSA obviously can’t, it would be best to steer clear of the autograph hobby. 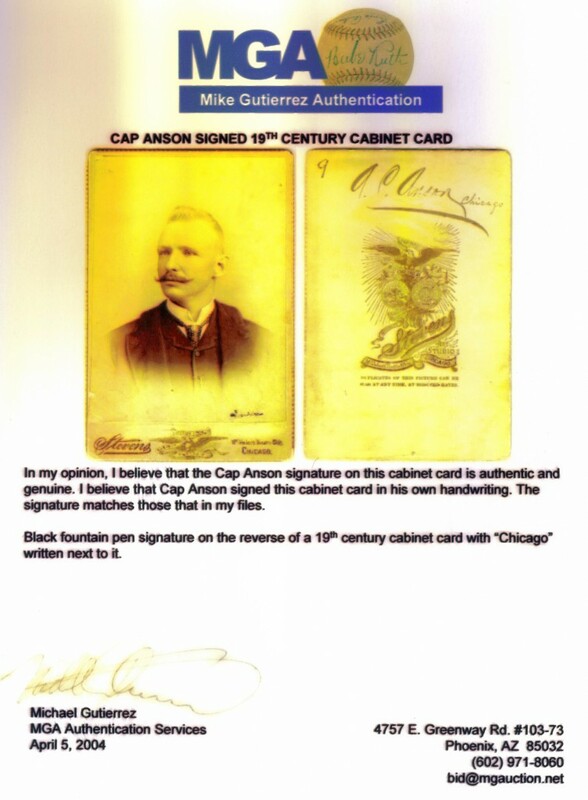 This LOA written by Mike Gutierrez says that the stolen Stevens cabinet of Cap Anson bears his authentic signature. But it is just an identification like the Welch example used on PSA Autograph Facts. Still not convinced? Then take a look at another stolen Stevens cabinet of Cap Anson that was once authenticated by Heritage Auctions’ consignment director, Mike Gutierrez, and his former MGA Auctions. The ink identification on the reverse of the cabinet card is again in the same hand. Experts should be able to identify different hands especially when they have authentic exemplars for comparison. Apparently, PSA/DNA is incapable of distinguishing such differences. The handwriting on the Welch cabinet matches the others and each card shares the NYPL placed "9" and library ownership stamp. 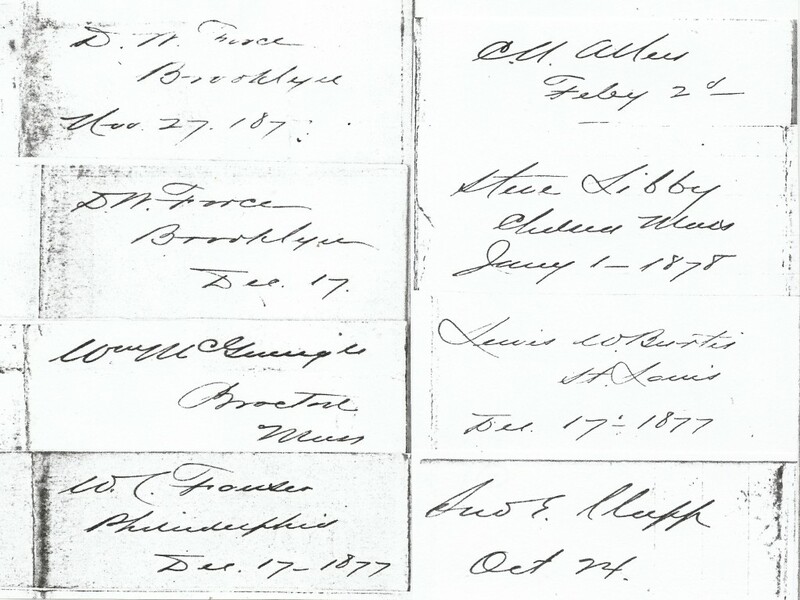 All of these stolen cabinet cards are marked with a handwritten numeral “9″ in the upper-left-hand corner, which denotes the storage box they were found in after they were donated to the NYPL in 1921. They all also exhibit evidence of a NYPL rectangular ownership stamp, although some have been partially defaced, like the Anson, which is believed to have been “bleached off” the card. (Bottom) Mickey Welch exemplar used on PSA Autograph Facts page that expert Ron Keurajian believes is a forgery added to a team sheet of 1930s signatures. 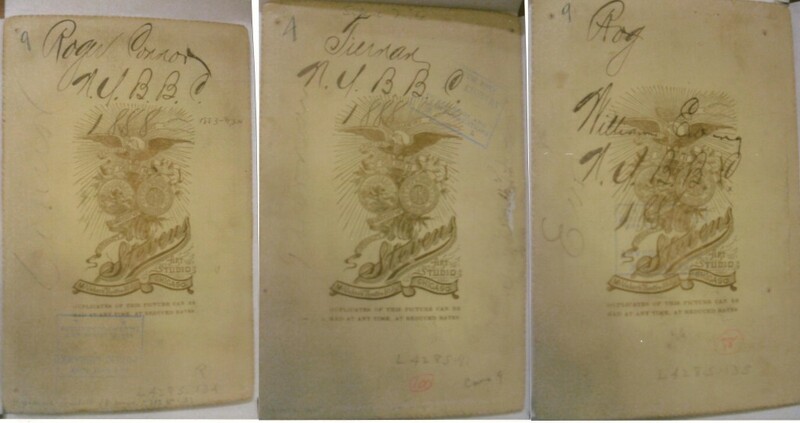 (Top) An authentic Welch signature from the Ford Frick papers at the National Baseball Library in Cooperstown. This particular Welch exemplar fits the bill. PSA should pick up a copy of Keurajian’s book, it would be a great asset. (Top) Authentic Candy Cummings signature from a letter on PSA Autograph Facts page. (Bottom) Period identification of Cummings from similar letter certified as genuine by PSA and posted on Autograph Facts as an authentic exemplar. Clearly, it is not written by Cummings. PSA’s Autograph Facts is littered with similar fraudulent listings of forgeries and mis-identifications of non-genuine items that PSA/DNA has likely authenticated previously for a fee. One prime example of this continued pattern of transforming trash to treasure is PSA’s inclusion of a non-genuine exemplar of HOFer Candy Cummings along with an authentic exemplar on the Cummings Autograph Facts page. Several months ago HOS identified that the non-genuine example was actually a secretarial notation on an actual known Cummings letter that originated from a collection of Buffalo BBC correspondence. The secretarial handwriting is identical to that which is found on other letters from the same collection that entered the hobby years ago. The stark differences between the identification and the genuine Cummings signature is striking, yet the experts at PSA could either not distinguish the differences, or perhaps, did not want to admit a mistake attributed to a big-ticket autograph that already had a PSA LOA in a private collection. All of these player names were written by an representative of the Buffalo BBC in the 1870s. 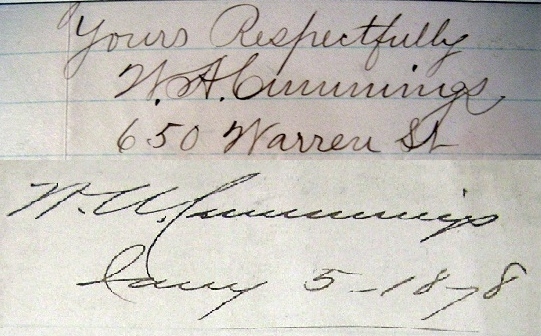 The same person wrote the "W. A. Cummings" identification that appears on PSAs Autograph Facts as an authentic exemplar of Cummings' signature. Both of these examples of PSA posting non-genuine signatures as authentic exemplars for collectors is further evidence of why the embattled authenticator has caught the eye of Federal investigators. While PSA is already said to be under investigation by the FBI for authenticating and grading Bill Mastro’s infamous T206 Honus Wagner card, the PSA/DNA autograph division has also come under scrutiny. UPDATE (March 8th 5PM): One of our readers has reported that PSA removed both the Mickey Welch cabinet card and the Candy Cummings cut as exemplars on the company’s “Autograph Facts” page. We confirmed that report after checking each of the links in the report published earlier today. this is why I stayed away from collecting scrawls. I never did find them very exciting. Seeing how PSA screwed this one up people can rest assured that they never screw up on the ruths mantles dimaggios and steve trouts of the world. Mr. Nash has singlehandedly done more to expose fraud in the sports collectibles hobby than all the other self professed do-gooders combined. While the rest of the hobby police are looking for shill bidding and bad autographs on ebay, Mr. Nash got his big boy pants on and is addressing the REAL issues of fraud in the hobby. If you don’t appreciate what Peter Nash is bringing to the table then you are part of the problem. His articles aren’t conjecture or false accusations, its just the facts. By PSA pulling them,it just shows how they screw up also and people think they are gospel,wake up collectors,you are being duped by many these days.